Lucius Annaeus Seneca (c. 4 BC–AD 65) —also known as Seneca the Younger or simply as Seneca — was born in Corduba, Spain. He was a Roman Stoic philosopher, statesman, and dramatist. He was raised in Rome, where he was trained in rhetoric and philosophy. Seneca tells us that he was taken to Rome in the "arms" of his aunt (his mother's stepsister) at a young age, probably when he was about five years old. His father resided for much of his life in the city. Seneca was taught the usual subjects of literature, grammar, and rhetoric, as part of the standard education of high-born Romans. While still young he received philosophical training from Attalus the Stoic. After a successful career as a senator and a period of exile in Corsica on a charge of adultery with the princess Julia Livilla, emperor Claudius’s niece, Seneca became first Nero's tutor, then his advisor when the latter became emperor. It was thanks to the influence of Agrippina, Nero's mother, that Seneca was recalled to Rome. As a writer, Seneca is known for his philosophical works, and for his plays, which are all tragedies. Seneca regards philosophy as a balm for the wounds of life. The destructive passions, especially anger and grief, must be uprooted, although sometimes he offers advice for moderating them according to reason. He discusses the relative merits of the contemplative life and the active life, and he considers it important to confront one's own mortality and be able to face death. Seneca was also a dramatist. Scholars have tried to spot certain Stoic themes in his tragedies: it is the uncontrolled passions which generate madness, ruination, and self-destruction. This has a cosmic as well as an ethical aspect, and fate is a powerful, albeit rather oppressive, force. Seneca was forced to take his own life for alleged complicity in the Pisonian conspiracy to assassinate Nero. The conspiracy was organized by Gaius Calpurnius Piso in AD 65. The plot reflected the growing discontent among the ruling class of the Roman state with Nero's increasingly despotic leadership. 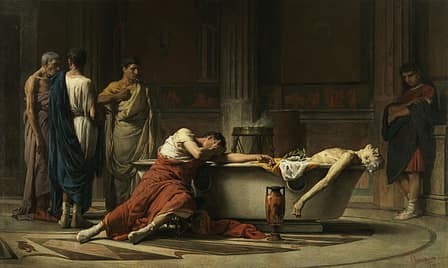 Although it is unlikely that Seneca was part of the conspiracy, Nero ordered him to kill himself. Seneca followed tradition by severing several veins in order to bleed to death, and his wife Pompeia Paulina attempted to share his fate. Fortunately, she was saved and was spared by the emperor. Seneca was exiled because of an alleged conspiracy to assassinate Nero. Seneca attempted to commit suicide by cutting his veins.